On May 22, Twitter shareholders will vote on whether to investigate a radical proposal: Turning the social network into a cooperative owned by its users. There's a campaign to turn Twitter into a user-owned co-operative, and shareholders will vote on it next month. If the vote passes the company will have to prepare a report on the feasibility of the radical restructuring. It's symptomatic of dissatisfaction among some shareholders as Twitter struggles to grow or turn a profit. Next month is the company's annual meeting, and one of the items on the agenda calls for it to look into becoming a cooperative. The proposal -- to be voted on by shareholders -- asks the company to "prepare a report on the nature and feasibility of selling the platform to its users via a cooperative or similar structure with broad-based ownership and accountability mechanisms." Twitter is opposed to the plan, and it seems unlikely to win the vote. But it's an interesting proposal -- and underlines the discontent some shareholders feel with the ailing social network, which is struggling to grow or turn a profit. The idea draws on a petition calling for a co-op structure that has been signed by nearly 3,500 people. The petition contrasts the social network's global reach and influence with the gloomy forecasts about its financial performance, arguing that its conventional structure means its social value isn't being properly appreciated. "For a lot of us Twitter is the fastest, easiest way to know and share what’s going on around us -- it sparks conversations, spreads information and energizes movements," the petition reads. "But Wall Street thinks the company is a failure because it’s not raking in enough profit for shareholders. That means that Twitter is up for sale, and there is a real risk that the new owner may ruin our beloved platform with a narrow pursuit of profit or political gains." A co-operative structure could, the proposal on the annual meeting's agenda says, "result in new and reliable revenue streams, since we, as users, could buy in as co-owners, with a stake in the platform's success. Without the short-term pressure of the stock markets, we can realize Twitter's potential value, which the current business model has struggled to do for many years. We could set more transparent accountable rules for handling abuse. We could re-open the platform's data to spur innovation." It adds: "Overall, we'd all be invested in Twitter’s success and sustainability. Such a conversion could also ensure a fairer return for the company's existing investors than other options." The Twitter proposal cites a number of examples of cooperatives as evidence it could work: "For successful enterprises like the Green Bay Packers, REI and the Associated Press, their popularity, resilience and profitability is a result of their ownership structure. Examples of online companies include successful startups like Managed by Q, which allocates equity to office cleaners, and Stocksys United, a stock-photo platform owned by its photographers." 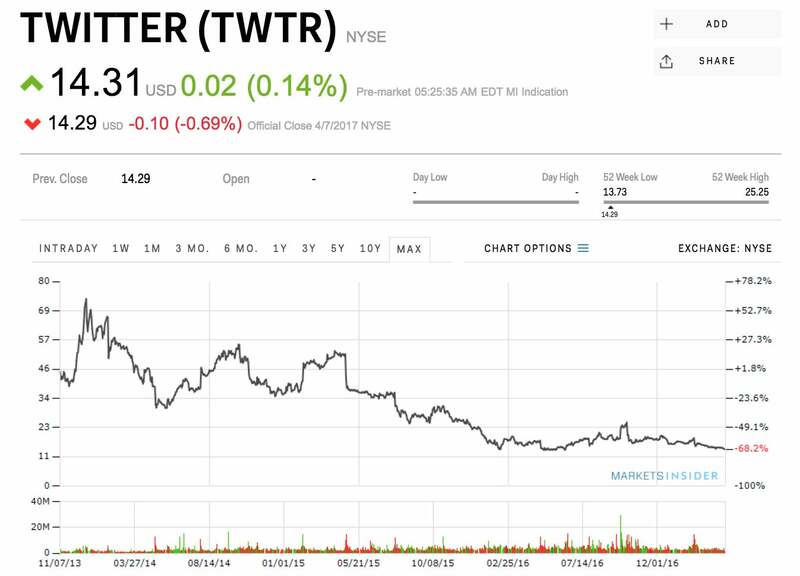 Twitter's stock has been on a downwards trajectory for years. "We believe that preparing a report on the nature and feasibility of selling the 'platform,' and doing so only to 'its users,' would be a misallocation of resources and a distraction to our board of directors and management -- resources and management time that could otherwise be used to build the long-term value of Twitter. The proposal would have Twitter explore the sale of the 'platform' to one specific group of people, 'its users,' 'via a cooperative or similar structure.' The proposal has pinpointed a very specific type of transaction and ownership structure and the board of directors does not believe that the course of action suggested in the proposal would enhance the value of the 'platform' or Twitter. Further, limiting exploration of strategic transactions that may enhance stockholder value to one narrow option would not be in accordance with the board of directors’ responsibilities to take actions that are in the best interests of Twitter and its stockholders. We believe Twitter is on track to continue building on the long-term value of Twitter for all of our stockholders as a publicly held corporation and not as a 'cooperative or similar structure' owned solely by 'its users.' As a publicly traded company, our users are also free to become stockholders of Twitter without any need to change the structure of the company." That last point is an important one -- users can already take ownership in Twitter, if they're prepared to go to the effort of buying stock. This unanimous opposition from the board means the vote is unlikely to pass. And even then, there'd be no guarantee on what the report into the possibility of becoming a co-op would say, or whether the company would follow through with it. But nonetheless, it's a fascinating look at an alternative structure for a major tech company. These days there's a trend towards consolidation of power and voting rights in founders. Thanks to a radical proposal, Mark Zuckerberg is selling much of his stock in Facebook (to fund his philanthropy) while retaining his voting rights. And when Snapchat parent company Snap went public earlier in 2016, it deprived would-be investors of voting power. One relatively rare exception is crowd-funding platform Kickstarter, which is a "public benefit corporation" -- a status that requires it to "consider the impact of their decisions on society, not only shareholders."